Architecture (from Latin, architectura and ultimately from Greek, αρχιτεκτων, "a master builder", from αρχι- "chief, leader" and τεκτων, "builder, carpenter") is the art and science of designing buildings and structures. A wider definition would include within its scope also the design of the total built environment, from the macrolevel of town planning, urban design, and landscape architecture to the microlevel of creating furniture. Architectural design usually must address both feasibility and cost for the builder, as well as function and aesthetics for the user. Planned architecture often manipulates space, volume, texture, light, shadow, or abstract elements in order to achieve pleasing aesthetics. This distinguishes it from applied science or engineering, which usually concentrate more on the functional and feasibility aspects of the design of constructions or structures. In the field of building architecture, the skills demanded of an architect range from the more complex, such as for a hospital or a stadium, to the apparently simpler, such as planning residential houses. 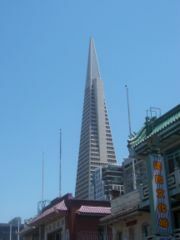 Many architectural works may be seen also as cultural and political symbols, and/or works of art. The role of the architect, though changing, has been central to the successful (and sometimes less than successful) design and implementation of pleasingly built environments in which people live. 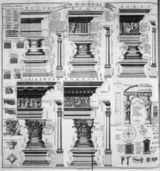 According to the very earliest surviving work on the subject, Vitruvius' De architectura, good buildings satisfy three core principles: Firmness, Commodity, and Delight ; architecture can be said to be a balance and coordination among these three elements, with none overpowering the others. A modern-day definition sees architecture as addressing aesthetic, structural, and functional considerations. However, looked at another way, function itself is seen as encompassing all criteria, including aesthetic, psychological, and cultural ones. Most modern-day definitions of "good buildings" recognize that because architecture does not exist in a vacuum architectural form cannot be merely a compilation of historical precedent, functional necessities, and socially aware concerns, but must also be a transcendent synthesis of all of the former and a creation of worth in and of itself. As Nunzia Rodanini stated , “Through its aesthetic dimension architecture goes beyond the functional aspects that it has in common with other human sciences…Through its own particular way of expressing values, architecture can stimulate and influence social life without presuming that, in and of itself, it will promote social development…To restrict the meaning of (architecture) formalism to art for art’s sake is not only reactionary; it can also be a purposeless quest for perfection or originality which degrades form into a mere instrumentality”. Architecture is an interdisciplinary field, drawing upon mathematics, science, art, technology, social sciences, politics, history, and philosophy. Vitruvius states: "Architecture is a science, arising out of many other sciences, and adorned with much and varied learning: by the help of which a judgement is formed of those works which are the result of other arts." He adds that an architect should be well versed in fields such as music and astronomy. Philosophy is a particular favourite; in fact the approach of an architect to their subject is often called their philosophy. Rationalism, empiricism, structuralism, poststructuralism, and phenomenology are some topics from philosophy that have influenced architecture. In modern usage, architecture is the art and discipline of creating an actual, or inferring an implied or apparent plan of any complex object or system. The term can be used to connote the implied architecture of abstract things such as music or mathematics, the apparent architecture of natural things, such as geological formations or the structure of biological cells, or explicitly planned architectures of human-made things such as software, computers, enterprises, and databases, in addition to buildings. In every usage, an architecture may be seen as a subjective mapping from a human perspective (that of the user in the case of abstract or physical artifacts) to the elements or components of some kind of structure or system, which preserves the relationships among the elements or components. Integrally speaking, architecture is a culmination and synthesis of all art forms, uniting sculpture, painting, and engraving as well as drama, music and dance, working in cooperation through the common ideal of awakening us to our individual freedom and task in life. The architecture literally defines a coherent and integrated community, and how this in turn affects social unity and harmony. 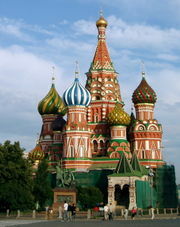 Saint Basil's Cathedral, Moscow, the most famous representation of Eastern Europe's Domes. The difference between architecture and building is a subject that has engaged the attention of many. According to Nikolaus Pevsner, European historian of the early twentieth century, "A bicycle shed is a building, Lincoln Cathedral is a piece of architecture." This distinction, however, is not a clear one, and contemporary scholarship is showing that all buildings, cathedrals and bicycle sheds alike, are part of a single continuum that characterizes the built world. Architecture is also the art of designing the built environment. Buildings, landscaping, and street designs may be used to impart both functional as well as aesthetic character to a project. Siding and roofing materials and colors may be used to enhance or blend buildings with the environment. Building features such as cornices, gables, entrances, fenestrations and textures may be used to soften or enhance portions of a building. Landscaping may be used to create privacy and block direct views from or to a site and enhance buildings with colorful plants and trees. Street side features such as decorative lighting, benches, meandering walkways, and bicycle lanes may enhance a site for passersby, pedestrians, and cyclists. Architecture first evolved out of the dynamics between needs (shelter, security, worship, etc.) and means (available building materials and attendant skills). Prehistoric and primitive architecture . As humans progressed and knowledge began to be formalised through oral traditions and practices, architecture evolved into a craft. Here there is first a process of trial and error, and later improvisation or replication of a successful trial. What is termed Vernacular architecture continues to be produced in many parts of the world. Indeed, vernacular buildings make up most of the built world that people experience every day. 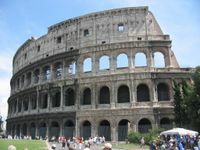 The Colosseum, Rome, Italy is an example of Roman architecture. Early human settlements were essentially rural. As surplus of production began to occur, rural societies transformed into urban ones and cities began to evolve. In many ancient civilizations such as the Egyptians' and Mesopotamians' architecture and urbanism reflected the constant engagement with the divine and the supernatural, while in other ancient cultures such as Iran architecture and urban planning was used to exemplify the power of the state. 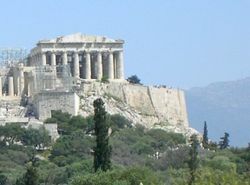 However, the architecture and urbanism of the Classical civilisations such as the Greek and the Roman evolved from more civic ideas and new building types emerged. 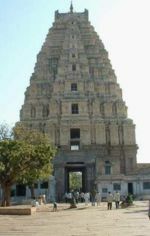 Architectural styles developed and texts on architecture began to be written. These became canons to be followed in important works, especially religious architecture. Some examples of canons are the works of Vitruvius, the Kaogongji of ancient China and Vaastu Shastra in ancient India. In Europe in the Classical and Medieval periods, buildings were not attributed to specific individual architects who remained anonymous. Guilds were formed by craftsmen to organise their trade. Over time the complexity of buildings and their types increased. General civil construction such as roads and bridges began to be built. Many new building types such as schools, hospitals, and recreational facilities emerged. Islamic architecture has a long and complex history beginning in the seventh century CE. Examples can be found throughout the countries that are, or were, Islamic - from Morocco and Spain to Turkey, Iran and Pakistan. Other examples can be found in areas where Muslims are a minority. Islamic architecture includes mosques, madrasas, caravansarais, palaces, and mausolea of this large region. With the Renaissance and its emphasis on the individual and humanity rather than religion, and with all its attendant progress and achievements, a new chapter began. Buildings were ascribed to specific architects - Michelangelo, Brunelleschi, Leonardo da Vinci - and the cult of the individual had begun. But there was no dividing line between artist, architect and engineer, or any of the related vocations. At this stage, it was still possible for an artist to design a bridge as the level of structural calculations involved was within the scope of the generalist. With the consolidation of knowledge in scientific fields such as engineering and the rise of new materials and technology, the architect began to lose ground on the technical aspects of building. He therefore cornered for himself another playing field - that of aesthetics. There was the rise of the "gentleman architect" who usually dealt with wealthy clients and concentrated predominantly on visual qualities derived usually from historical prototypes. In the 19th century Ecole des Beaux Arts in France, the training was toward producing quick sketch schemes involving beautiful drawings without much emphasis on context.. The palace of Versailles in France is largest palace in europe and served as the model for european royal residences for over 100 years. Meanwhile, the Industrial Revolution laid open the door for mass consumption and aesthetics started becoming a criterion even for the middle class as ornamented products, once within the province of expensive craftsmanship, became cheaper under machine production. The dissatisfaction with such a general situation at the turn of the twentieth century gave rise to many new lines of thought that in architecture served as precursors to Modern Architecture. Notable among these is the Deutscher Werkbund, formed in 1907 to produce better quality machine made objects. The rise of the profession of industrial design is usually placed here. 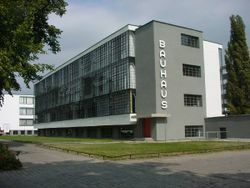 Following this lead, the Bauhaus school, founded in Germany in 1919, consciously rejected history and looked at architecture as a synthesis of art, craft, and technology. When Modern architecture was first practiced, it was an avant-garde movement with moral, philosophical, and aesthetic underpinnings. Modernist architects sought to reduce buildings to a pure form, removing historical references in favour of purely functional structures. The columns, arches, and gargoyles of Classical architecture were dubbed unnecessary. Buildings that flaunted their construction, exposing steel beams and concrete surfaces instead of hiding them behind traditional forms, were seen as beautiful in their own right. Architects such as Mies van der Rohe worked to reject virtually all that had come before, trading handcrafted details and sentimental historic forms for a machine-driven architectural geometry made possible by the Industrial Revolution. Many people saw Modernism as dull or even ugly. As the founders of the International Style lost influence, Postmodernism developed as a reaction against the purity of Modernism. Robert Venturi's contention that a "decorated shed" (an ordinary building which is functionally designed inside and embellished on the outside) was better than a "duck" (a building in which the whole form and its function are tied together) gives an idea of this approach. Another part of the profession, and also some non-architects, responded by going to what they considered the root of the problem. They felt that architecture was not a personal philosophical or aesthetic pursuit by individualists; rather it had to consider everyday needs of people and use technology to give a livable environment. The Design Methodology Movement involving people such as Chris Jones, Christopher Alexander started searching for more people-orientated designs. Extensive studies on areas such as behavioural, environmental, and social sciences were done and started informing the design process. As many other concerns began to be recognised and complexity of buildings began to increase in terms of aspects such as services, architecture started becoming more multi-disciplinary than ever. Architecture now required a team of professionals in its making, an architect being one among the many , sometimes the leader. This is the state of the profession today. However, individuality is still cherished and sought for in the design of buildings seen as cultural symbols - the museum or fine arts centre has become a showcase for new experiments in style: today one style, tomorrow maybe something else. Frank Lloyd Wright's Famous " Fallingwater"